By the mid-way point of the 2002 season, the Top 20 passers had five additions to the list. San Francisco 49ers quarterback Jeff Garcia reached the required 1,500 career attempts in the second week of the season to enter the list at No. 3. One week later, Kurt Warner supplanted Steve Young as the game's all-time passing leader. Brian Griese of the Denver Broncos and the Kansas City Chiefs' Trent Green were two other newcomers in 2002. Steve McNair of the Tennessee Titans bounced on and off the list much of the season but was displaced in the final week of the year. At the completion of the 2002 season, nine active quarterbacks ranked among the career leaders based on passer rating. 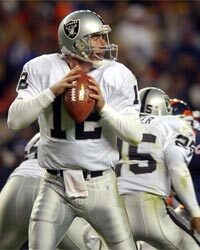 Rich Gannon of the AFC champion Oakland Raiders enjoyed the finest campaign of his NFL career as he climbed to ninth place. Gannon completed an NFL record 418 passes for a career high 4,689 yards. In doing so, he also set the NFL mark for 300-yard games in a season with 10. Four other active passers - Brett Favre (No. 5), Peyton Manning (No. 8), Mark Brunell (No. 10), and Brad Johnson (No. 11) also rank among the Top 20 career leaders. JEFF GARCIA entered the Top 20 in Week 2, KURT WARNER in Week 3, BRIAN GRIESE in Week 7, TRENT GREEN in Week 8. STEVE McNAIR entered and was later displaced from the Top 20 several times during the season. David Krieg (81.5), NEIL O'DONNELL (81.6), Troy Aikman (81.6), and Danny White (81.7) were displaced from the Top 20 in 2002. Players active in 2002 who rank the closest to a Top 20 ranking: STEVE McNAIR (81.7), NEIL O'DONNELL (81.6), STEVE BEUERLEIN (80.9), CHRIS CHANDLER (80.7), JEFF GEORGE (80.4), DONOVAN McNABB (79.3), and JEFF BLAKE (79.2).